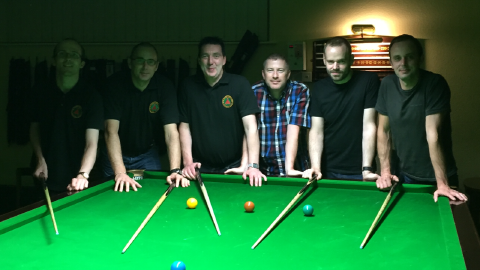 The opening week of the David Wain Insurance Premier Division of the Burton and District Snooker League saw reigning champions Burton Cons A host one of the promoted sides, Alrewas A. The match began with John Shilton playing John Richardson. Shilton won both frames with a succession of fine potting. Richardson did have chances and could have pinched a frame when he under cut a blue into the centre pocket with the balls at his mercy. On the other table, Stuart Roberts got his first win of the season against Colin Wood, aided by a 32 break. The second half of the match began with Owen Jones playing Tom Smith. The first frame went the way of Jones after a spluttery start. The second was more decisive as Jones cleared the final two reds with colours and the remaining colours to take it with a 38 break. Finally, Darren Coady played Karl Hancox, who won the only frame on the night for the visitors in a hard fought draw. The final score was 7-1 to the hosts. Belmont A kicked of the season in style winning 7-1 against their B team. Ian Archer played Micky Morris, which was a typical 1st game of the season affair with Ian taking the frame. The second game between the two was an entirely different affair. Ian opened with a 54 break, was slightly unlucky not to get more. Micky Morris came back with a decent 29 break. This wasn’t enough as Ian does what comes naturally to him winning both. Rich Goldby vs Brett Craddock was controlled by the excellent match play of Goldby. Brett came back at him strongly several times but Rich proved too strong in the end. The game of the night was between two of the youngest players in the premier division. Josh Gebbie against Leo Worsley. Josh and Leo finished both their games within 40 minutes, with some outstanding play from both. Josh came out with the 2-0 victory, showing the bit more experience he has gained over the last few years. The future of Belmont snooker looks bright there. The final game was between two veterans of the snooker league. Graham ‘the grinder’ Bailey played Zaheer Hussain. Zaheer had some bad run in the early part of the frame and this was the difference come the end of the frame putting the A team 7-0 up. The 2nd frame between the two saw Zaheer dig deep and show some of his old form beating Graham on the brown to avoid the whitewash and make it 7-1. Ashby Ivanhoe A began the season with a win as they beat Spot On C 6-2. Andy Marriott meant business as he won both frames against John Hardy with breaks of 57, 49 and 36. On the other table, Ian Rennocks was also in fine fettle as he also won both frames against Trevor Heath, making breaks of 38 and 36 in the process. Captain Mick Kirk then shared the frames with Steve Gaunt. Kirk took the first frame, but some good potting from his opponent won him the second. Tony Clements won the first frame against Ant Moore with breaks of 34 and 32. Moore came back to win the second frame on the final black. Rolleston A found the going tough on their return to the top flight as they were beaten 6-2 at home against Burton Cons B. Mike Buckland played nicely to beat Joe Docksey, who struggled to get going on the night. Buckland left very little for his opponent and made a good 40 break. James Wilkinson won the first frame against Jon Swift but the Cons’ man came back well to win the second. The second half began with Simon Smith potting very well to win the first frame against Tony Rushton. The home player came back well to win the second and earn a well deserved draw. Ryan Gibbs sealed the win for the visitors by beating Bobby Cliff, winning the first frame comfortably and then the second frame on the pink. Swadlinote Snooker Centre A came out on top against Ashby Ivanhoe B. Steve Ayre and Jason Pickering shared the frames with some good potting. Chris Dewey and John Skellett then did the same with Skellett knocking in a 34 break. John Davis drew with Bren Mattley. Andy Goldingay proved to be the deciding factor as he won both frames against Stuart Tagg to earn a 5-3 victory for the hosts. Spot On A won 6-2 at home against Swad Cons A. Ade Harper potted well to defeat Mark Swift. Andy Speirs then knocked in a 39 break as he beat Paul Slater. Tom Elliott also won both against Mark Hadley. Finally, Mark Stirling found Andy Grainger to be too good on the night as the visiting player won both frames to complete the scoring. Tutbury A opened their account with a 5-3 win against Spot On B. Chris Mabbot played well to beat Lee Cooke and Dave Mabbott knocked in a 40 break in beating Steve Lane. Steve Mabbott shared the frames with Steve Butterworth with Mabbot making a 35 break. Finally, Loz Kennerson won both frames against Steve Hathaway to close out the match. The PJM Fascias Division One will prove to be a tough division to get out of this season with some strong relegated sides and some good ones having come up. The first team to put down a marker were one of the former Chimneys sides who were surprisingly relegated last year. They now play out of Tutbury and the team consisting of Alan Davies, Wayne Pereira, Daz Lester and Dean Johnson went to Woodville and blew away their A team who had been promoted from Division 2. Pat Ryan had included a nice 23 but was unable to win in his match against Daz Lester. Another relegated team, Stapenhill A, also handed out a thrashing, defeating Rolleston B 7-1. Jason Spiby, Andy Tomlinson and Andy Gretton were all too strong for John Harvey, Kev Norris and Lionel Lewis whilst Rob Tubey spared the blushes of a whitewash by snatching a frame off of Carl Jeffcoate. The third relegated side who showed they are also in the mood to bounce straight back were Alrewas B. The Alrewas Royal British Legion was heaving with remembrance as many military personnel had arrived after the 12 anniversary of the Iraqi conflict memorial to the fallen at the Arboretum.Glasses were raised all round.The snooker was much less impressive though as Carl Poulton and Bryan Sharratt struggled with early season form in a gruelling encounter that Poulton took 2-0, one on the final black but the other more comfortably. Tim Knopik came out blazing for Stapenhill against Adam Walton and looked to be cruising to the first frame. But Walton didn’t cave and took it to the last black and snatched it.. Knopik took a deserved share though with some excellent potting second frame. Dave Trueman, the new captain of the Alrewas B team, opened up well against Greg Britton. Britton is the new Stapenhill lead man, after Jon Swift’s transfer window move to Burton Cons B, but he couldn’t stop Trueman in the first. The second he did win and cleared brown to pink to take a deserved 1-1. That left James Edwards to bring it home the win for Alrewas B against John Sherriff. Sheriff couldn’t handle Edwards firepower and Alrewas got their win. Last season’s Division Two champions, Baulkine, opened up in their new guise as Rolleston C but were only able to win 3 of the 8 frames handing an early season victory to SDSC B.Adam Harrison, for Swad Snooker Centre, showing a welcome return to league snooker defeated Tom Lucas who only lost 6 frames in the league last term. Pete Maguire also used his experience to hand a defeat to Jon Sully. Billy Ashton had runs of 22 and 23 against Henry Tomas but this was only good enough to win him one of the two frames for a well contested draw. Mark Storr, for Rolleston, started the season well with a 25 in his win over Ben Davies. Another SDSC side starting with a win was the D team. Andrew and Brian Bloor were impressive in their wins over Tom Egginton and Dave Shipton of Burton Cons C. Lee Louch put the Cons in the match with a comfortable 2-0 win over Garton Bloor. The match between one of the league’s main sponsors, David Wain, and the Cons’ captain Ian Shrive ended in a deserved draw with David knocking in runs of 24 and 25 along the way. The sixth side in the division to start with a win was Ashby Ivanhoe C. They have also got recent Premier Division experience and Gaz Dolman and Daz Wilson showed this as they defeated the two Tewkesbury boys from Swad. Mike Staley started the season well, including the division’s high break of the week of 29, in his win over Jerry Cook whilst the match between Ray Bancroft and Steve Cockerham ended in a draw. The only match ending in a share of the spoils this week took place at Swad Cons. where the B team drew with Newhall A. Bob McNulty started with a fine win over the normally consistent Martin Hicks whilst on the other table Paul Hollis ran in a nice 25 in his match against Martin Hurdman. This was good enough only for a draw however. In the second half Mark Anslow knocked a good 28 for Newhall whilst defeating Gerald White and in the other match Newhall’s Sam Hicks drew with the Cons’ Vince Draper. It was a case of ‘one out of three ain’t bad’ for those teams relegated to division 2 as only Tutbury C took maximum points from a strong Ivanhoe D side, with a handful of steady breaks from both teams. Alrewas C and Woodville D shared the points on the night whilst a solid Burton cons A team took out Belmont D, the Belmont boys have secured new recruits for this season and super signing Matt Groves certainly showed he can hold his own as he shared the frames against highly ranked Ian Protheroe. Swad Con’s Bob Birch got his team off to a good start with a win over Gilda Horath of the Self-styled ‘Snookette’ Spot on D team. Marie Bridges went on to certainly hold her own against a strong Kieran Dadley- Marie potted Blistering blues in both frames and made a flurry of strong breaks but it wasn’t to be as Kieran took both frames on the night. Andy Boam and Yvonne Spendlove also had a real tussle, the second frame sadly ending in a fouled black off a gutsy shot from Yvonne. Yours truly saved the Snookettes from a whitewash with a ‘banterful’ draw against Dave Boddy. Sadly, Alrewas D could only raise 3 players on the night, Woodville B capitalised with a 5—3 win. Terry Bosworth got Belmont C off to a good start with a comfortable 2 nil win against John Ward of Rolleston, Brian Cutting and Neil Cheadle shared their frames and Belmont Cs newcomer Graeme Drayton took on the experienced Steve Atkin. Steve was unlucky to lose the first frame going in-off on the black, taking the draw well on the second. Dave Press had a good 2 nil win against Dave Bentley to give the home team a comfortable win on the first week of the new season. Swad Cons C had a difficult first week draw against Woodville D, Mark Satchwell taking the divisions highest break of 31, followed by maximum points from both McNulty brothers, Gaz Ward managed to avoid the whitewash, taking a draw against John Chambers who completes a blistering line up for the Woodville Wonder-boys!